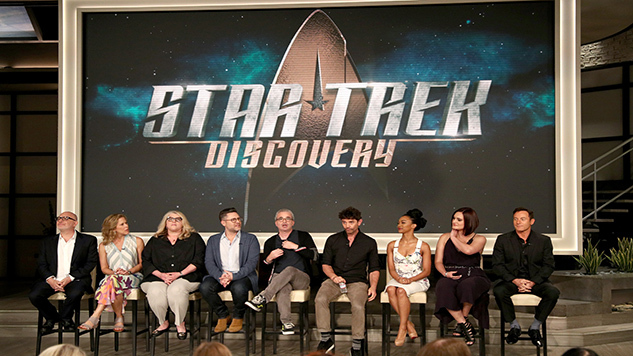 The studio behind Star Trek: Discovery has signed the show’s co-creator and executive producer Alex Kurtzman to a new five-year overall deal. The deal will see Kurtzman at the helm of expansion efforts for the show, including the development of a new Star Trek series, miniseries and other content, including animation. There are not yet any specifics on any of the projects, but Kurtzman may reveal some at the upcoming San Diego Comic Con, according to Deadline. Production on season two of Star Trek: Discovery is currently underway—the premiere episode was directed by Kurtzman. CBS Television Studios’ deal with Kurtzman and his company Secret Hideout is reportedly worth something in the neighborhood of $30,000. Heather Kadin serves as Secret Hideout’s president and Aaron Baiers as its SVP of television. According to Variety, the deal also stipulates that CBS studios will have exclusive rights to produce all television created and produced by Kurtzman and Secret Hideout. They currently produce the CBS shows Hawaii Five-O, Salvation and Instinct. “There is a very short list of writer-producer-directors that every film and television studio wants to be associated with, and Alex and his Secret Hideout team are always at the top,” said David Stapf, president of CBS Television Studios. Secret Hideout will also develop new, non-Star Trek original series across broadcast, cable and streaming platforms. As a part of the process, they will be expanding the production operation and adding diverse voices. The news of the deal comes on the heels of an announcement that Kurtzman would be taking over as showrunner on Discovery season two. Kurtzman is replacing Aaron Harberts and Gretchen J. Berg in the role. Kurtzman’s other series credits include Sleepy Hollow, Alias and Fringe. He has also been involved in the Now You See Me and Transformers franchises, as well as the Star Trek franchise.